Kotaku’s own Stephen Totillo said in the comments of his ReCore review, regarding Nintendo and their second/third-party development teams, “Nintendo ensures a higher floor for quality. Nintendo seems to be willing or able to give studios the most possible time for polish.” This isn’t something new to gamers, especially the Nintendo fan base, and the sentiment holds true for Code Name S.T.E.A.M. Technical and visual polish aren’t missing here. As memorable as the game wants to be, I think it ultimately ends up being forgettable. The developers tried to infuse a lot of humor and fun into the dialogue, and I’m not saying that they failed, but it never comes off as striking or interesting. On paper, the quirky setup of Lincoln as the leader of some steampunk assault team is cool, but more often than not the execution feels just a little flat. 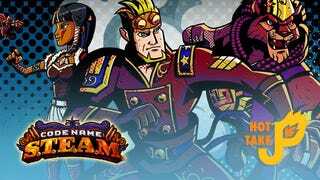 Gameplay wise, the Code Name S.T.E.A.M. is spot on. Many have made comparisons to the tactical shooter game Valkyria Chronicles. I haven’t played it (though it’s on Steam), so I can’t confirm how similar it is. I can say that the variety of weapons and characters makes every situation feel different, and the difficulty makes each level both mentally taxing and satisfying. Beyond that, levels are all different and challenge players to think through multiple solutions. Each level offers three gears to collect. While I love the idea of collectables, levels tend to run long so the practice of finding them after-the-fact can be a chore. When the game originally came out there was an issue with absurdly long enemy turns. Intelligent Systems released a patch soon after release to alleviate this. I’ve said it before, I love a game that offers amiibo support. Intelligent Systems, the developers for the new Fire Emblem series of games, also included support for most Fire Embelm character amiibo (though not the DLC characters Roy and Corrin). They come with their own unique abilities and weapons, but aren’t designed in a way that is game-breaking. While Code Name S.T.E.A.M. is definitely worth gamer’s time, I can’t say it’s worth a gamer’s time at full price. Luckily it’s available from most retailers at a discount now. It’s a great game with plenty of polish and near perfect gameplay difficulty and variety. Fans of tactical games should be sure to pick it up, and anyone with a middling interest in strategy would be rewarded in giving it an opportunity. Forgettable or otherwise, it delivers what ultimately matters: Solid gameplay. Hopefully John bought enough oil because I bet Henry’s ‘Mechanical Bits’ can cause some damage.